Taking the bus is not the first (nor second!) way most Californians think of to get from Los Angeles to San Francisco. Flying is the way to go and if for some reason you can’t fly, you drive. In recent years, though, these busy air routes have become increasingly more expensive and exhausting, as is any trip through the airport crowds and security. Driving is a long and even more tiresome option and is not very sustainable, especially if you are traveling alone. So I was glad to discover the budget bus services filling in until we have the long-awaited option of high-speed rail here in California. Last year at about this time, I published a post detailing my experience using the (at the time) newly introduced budget bus service, Megabus (see Megabus: A New Way to Get from Los Angeles to San Francisco). This year I wanted to share my experience with an even newer entry to the California intercity express bus market, Boltbus. Boltbus is owned by Greyhound Bus Lines, but is operated as a somewhat more upmarket brand offering free wifi (with electrical outlets) on all buses, and a budget travel bonus — on each bus, a ticket is randomly offered at $1, giving them the slogan “Bolt for a Buck”. The company started running routes radiating out of New York City in 2011. In October 2013, they introduced service to California running buses between Los Angeles, San Jose, and Oakland. San Francisco and Las Vegas were added to the map in December. When I decided to go down to Los Angeles for the recent LA Times Travel Show, I decided to save some money and take Boltbus to see how it compared to last year’s Megabus adventure. So I bought a round trip ticket for the six-hour drive from San Jose’s Diridon Station to Union Station in Los Angeles. While I did not get the random $1 ticket, I only paid $23 for the round trip ticket. Compared to $180 for a return flight (or more than $70 for the cost of gas to drive), the ticket was a steal! I just checked today for tickets toward the end of this month and it seems prices range from $9 to $24 one way, depending on what days you travel on (Friday and Saturdays cost the most). Nevertheless,$48 round trip is a still a good deal. The one major problem I had with Boltbus was that their website wasn’t open for ticket sales until about three weeks before the date of departure. I tried a few times over the few weeks before that and each time I got an error message that said something like “The schedule has not been released for this date yet. Please check back 4-6 weeks before your date of departure”. And as I said, I continued to get that message until almost three weeks before departure. If the bus had been full, this would have been a problem because booking a flight at such short notice would have been very expensive. Luckily (for travelers), the buses are still not running at capacity, but when they are this could pose a problem for people trying to plan trips in advance. Like Megabus, the buses were clean and brand new. The seats where spacious and comfortable, though I preferred the warmth of Megabus’s upholstered seats to Boltbus’s leather-ish seats. Like Megabus, the route stops for 30 minutes at a rest area midway between San Jose and Los Angeles so that you can get something to eat and use the bathroom (though there was a clean bathroom on board). Generally, the experience was the same. As I mentioned last year, Megabus’s double decker vehicles are not allowed to travel over the mountainous Grapevine/Tejon Pass , north of Los Angeles, in icy, winter weather. This almost led us to be re-routed all the way around the mountains, which would have added a whopping 8 additional hours on to a normally 6 hour drive! So that’s a risk you take when taking Megabus in the winter. Because Boltbus’s coaches are only one level, there is less need to worry about this. Also, I found Boltbus to be warmer than I remember Megabus, which I believe is because it’s harder to regulate the temperature in a double decker bus. I did like the enjoy the expansive views from the top-level front seats on Megabus, but it’s not worth the risk of delay and discomfort of the cold. Strong wifi! Though both buses were at low capacity and had similar numbers of total passengers, the Boltbus wifi signal was much stronger and more stable than the Megabus signal which was virtually unusable. I tried connecting a few times on Megabus off and on and I could not get it to stay connected for more than a few minutes. The Boltbus connection, however, stayed connected through most of the drive, though it did drop off once on the trip down. Still, it was nice to connect my laptop (and even my phone) to this stable wifi and get some work done on the drive. 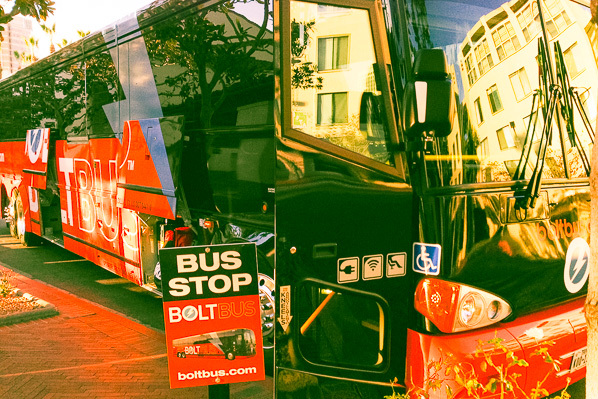 In summary, while there were a few things that irked me about Boltbus, I still think it’s a great way to get from Los Angeles to San Francisco and other Bay Area cities on a budget. We went to Vegas from LA, by Voltbus. The cheapest and convenient way of traveling. At first, we were having a secong tought of how to get around Vegas without having your own car. Then, using our ipad mini we were able to use the google map on how to get around by comutter bus. Everything was so easy and hassle free with the travel we had. Thanks to Voltbus, i will tell all my friends how easy, convenient and relaxing to be on your bus while travelling. Free wifi, aircondition system is so amazing, foot rest. We cannot content ourselves how lucky we are to have chosen your service. Hi Rose, I’m glad you had a good experience! Do note, I’m not affiliated in any way with Boltbus (nor Megabus) — I’m just a happy customer. Glad they started service to Vegas, too! Hi Cassie. It’s been good reading your blog. Just wanted to know if this trip from SFO to LA, through Megabus or Boltbus, was through the Pacific Coast Highway? Hi Saurabh, good question. Neither of these routes travels down the Pacific Coast Highway. They go down the center of California (I-5) which is the fastest and most efficient route to get between the two cities–it takes about 6 hours that way. Driving all the way down PCH/Highway 1 from San Francisco to Los Angeles takes much longer–over 12 hours. If that’s what you want to do, I would recommend renting a car and doing it over 2 or 3 days so you have time to stop and explore. Ah ok, I was looking for a bus trip along the PCH spread over 1-2 days. Will check them out. Couldn’t find a 1-day trip though. I don’t know of any bus trips that go all the way down the coast, so if you find one, please let me know! A reader asked about that once before so I’d love to send him what you find out! Best of luck and have a great trip!